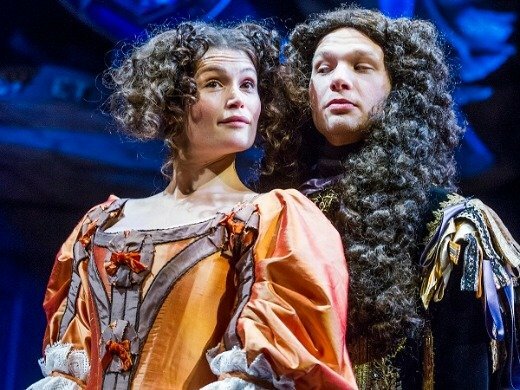 Following a sell-out run at Shakespeare’s Globe, Jessica Swale’s extraordinary play Nell Gwynn now transfers to London’s West End. 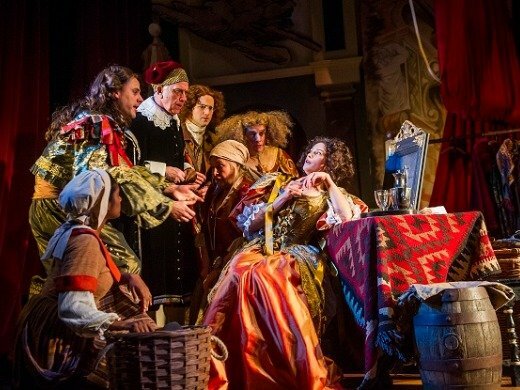 Swale’s acclaimed play is a sparklingly entertaining take on the true story of unlikely heroine Nell Gwynn who became one of the first women actors in England, winning the love of the public and of the King in the process. Starring the award-winning Gemma Arterton (Quantum of Solace, The Duchess of Malfi, Made in Dagenham) as the ‘witty and pretty’ Nell (or so said Samuel Pepys), the hilariously funny and deliciously ribald Nell Gwynn is not to be missed. 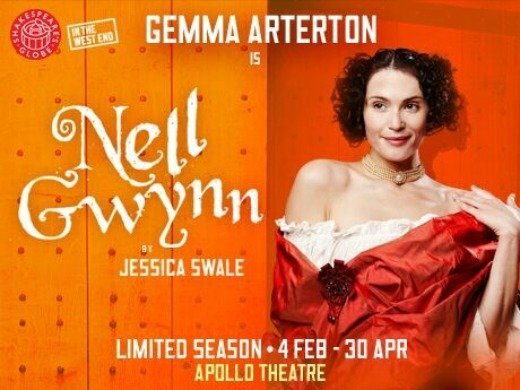 Playing at the Apollo Theatre from February, book your Nell Gwynn tickets today. 12+ Contains references of a sexual nature. Feel good, brilliant show!! Must see! All all-round dazzling performance by Gemma Arterton and her supporting cast. Funny, cleaver, witty and brilliantly acted - one of the best theatre performances I have ever seen!! Worth every single penny and would go again. Lovely performance from Gemma Artterton (sp?) in this fun play. She manages to be the star but as part of the company - never a diva and completely natural - everyone gets a chance to shine a bit. Great fun and bawdy without being vulgar. The spaniel was also fabulous! Mildly entertaining, reminded me why 'off West End' theatres often offer better productions, better seating, better value for money and a more intimate atmosphere where the audience can really engage with the actors. However, I thought that the set was beautifully designed. Why is this show coming off? Its fantastic!! Beautifully written, exemplary performances, great music excellent choreography, brilliant set and plenty of 'bums on seats' What more does it take? Briefly. I/we didn't really know what to expect, however, were entertained from start to finish. The cast were all very strong and Gemma incredible. So very sassy and convincing in her role! There is great energy and comic timing. Go and see it, you won't be disappointed. A wonderful rollicking night, with a clever entertaining and thoughtful script, illuminated by a brilliant scene-stealing cast led by the magnificent Gemma Arterton. Thoroughly enjoyable. Excellent play. Glad we went. Please do not miss this it is a real treat. The play is extremely well written, full of excellent humour. The actors and actresses work in perfect harmony to deliver a wonderful performance. 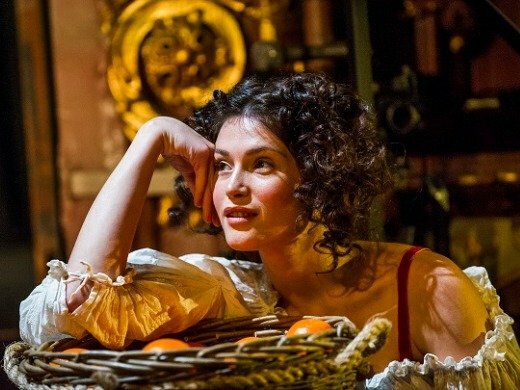 Gemma Arterton is quite exceptional in the role of Nell Gwynn. .
A wonderful night's entertainment, with brilliant acting especially from Gemma Arterton who was endearing and hilarious. A fun production, but the diction was not very good at times, and so with the music it was difficult to hear everything which was a pity, as it is the actors primary role is to communicate to the audience. 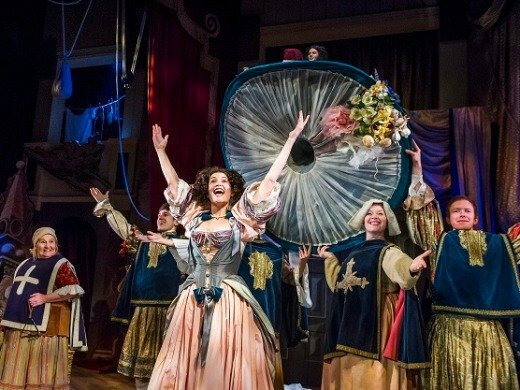 If you fancy a joyous evening out, full of frills & laughs, great acting, stage sets, costumes, ace carry on comedic jokes & timing, mixed brilliantly with a real love story, dealing with class, politics & gender don't miss "Nell Gwynn". Gemma Atherton is a wonderful. Whole cast are fab. It's a Triumph Darlings! I laughed so loudly the people behind asked me to "Shhhh!" I ❤️'d it. The music & songs are so authentic & catchy, I sang "I can dance! I can sing! I can do the other thing! all the way home. Nell Gwynn was an absolute delight. The set was beautiful and authentic, the lighting was brilliant, the costumes were gorgeous and the acting from all was first class. A glorious two and a half hour feel good fest. Well done to all involved in this fantastic production! The evening was excellent , thoroughly enjoyed the play and would recommend it to anyone. A fun show where the enthusiasm and enjoyment of the cast is infectious and influences the audience's enjoyment. Gemma Arterton is a fine comic actress although Michele Dotrice steals the show in the 2nd act. It was more of a pantomime type show than I was expecting but was still a happy, feel good show. An entertaining afternoon. Not the most intellectually stimulating piece I've ever seen, nor does it really add anything to the history of Nell Gwynn, but it was a fun and enjoyable musical. Gemma Arterton was charming as ever, as we most of the cast. I do wish the show had been advertised as a musical though. For a play there was a little too much singing and dancing for my taste. Great show. Very original writing. Loved it. I wasn't sure what to expect Took my Mum as a birthday present and couldn't have been more delighted. Fun, with catchy tunes and jigs! Baudy and cheeky - great performances all around but especially Gemma Atherton as Nell. We thought that Gemma Arterton was excellent and a joy to watch, but various other aspects of the play felt rather labored and clunky. A fun night out if you suspend all judgement regarding historical reality. Nell Gwynn - Go see!! Fabulous - joyous, funny and clever with a bit of history thrown in. Great fun and a few bits to think about. Play was wonderful. The actors were all charming. There was enough variety of mood to keep it fun and light hearted even with some quiet moments of pathos. The whole thing had a really engaging and intimate feel to it. Well done everyone! A wonderfully vital, energetic show. A familiar story told with style, wit and music. A delight to the eye and ear. Performances that left me breathless. Simply magnificent. Loved the production!! Funny, entertaining and enjoyable!! Would definitely recommend it! Gemma Arterton sparkled!! Will definitely look out for her next project. A lively, entertaining encounter with historical characters. Restoration Comedy updated and uproarious. Catch it while you can!! Everything about the night was enjoyable. The audience was ready to laugh--and did so frequently. That made the atmosphere really fun and the actors responded to it. Gemma Atterton can really sing, btw. Overall, a great night! Nell Gwynn was a brilliantly written and wonderfully acted production. We saw a matinee performance in a full house. A lively ensemble cast were all equally good. Gemma Arterton shines in the lead and Michelle Dotrice wins every time with her comic character. Enjoyable musical numbers compliment the bawdy humour. Great fun. This play is wonderful! A beautiful set, great acting, very funny, and most of all the perfect star! It was so exciting to see Gemma Arterton, as I have admired her in films and on TV since she first appeared. I assumed it was a straight play, so was pleasantly surprised with all the excellent music, so well played, and the funny and enjoyable songs. A really great experience! I really enjoyed myself! Plenty of laughter. Wonderful costumes and great humour. An unexpected delight to watch. Nell Gwynn was a pleasure to watch and the experience from a box seat amplifies that feeling. This was a modern show of an old script. The acting was top notch with some great performances in particular from the lead actress Arterton (Gwynn) - hilarious and a joy to watch. The scenography was really combining the classic with the modern and the costumes were colourful and amazing. Overall, we had a great time and lots of fun.. It was one of the best things we have seen in ages . Loved every moment . Would thoroughly recommend this show. Great fun. Gemma is superb. Great stage presence. Fabulous, irreverent and joyful. Wonderful production and cast. Most enjoyable show & I thought that Gemma Arterton was quite superb in the leading role ably supported by an excellent cast. 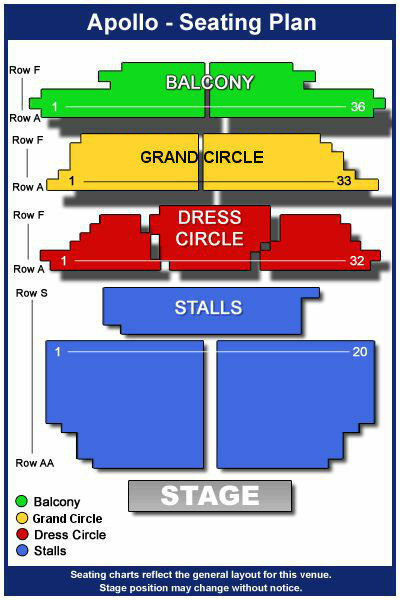 At £30 my ticket was also good value & will be scouting for other shows in the coming future. A vigorous,rollicking revelry,full of humour,whit and good natured humour with a little pathos here and there. Wonderful energetic performances from all the cast led by the lovely Gemma accompanied by the musicians. The scenery was excellent. Hats off to Jessica Swale. A joyful, entertaining afternoon,theatre at its best. to the playwright Jessica Searle. What a superb entertainment. Excellent script, brilliantly acted with joyful songs. Set, scenery & props all good. There were outstanding performances and I left the theatre with a fill-good factor and a desire to find out more about Miss Nell Gwynn! I thought the show was incredibly funny and I enjoyed the style of acting. I did feel the second act whittled through it all quite quickly but overall I thought the show was a laugh and a bit of fun. I can't praise the cast enough! Hadn't expected this to be so 'laugh out loud funny'. Superb writing and great performances from the whole cast especially Gemma. Brilliant performance by the whole cast. Great sense of timing and a wonderful mix of comedy and pathos. Loved the staging. A great night out. A great funny show well worth seeing. And what a beautiful theatre. A great show. Most enjoyable. We liked the show, but think that was because Gemma Arterton carried it. She is so graceful and of course lovely, but with plenty of attitude too. There was too much slapstick, especially the scene with the door, which really did scrape the barrel and went on forever. Have seen this show twice and it is brilliant. Based on Nell Gwynn the orange seller and mistress to King James (Stuart). Runs along at a good pace with chuckles and songs included.